Y'all, I have had a break-through. Saturday I woke up early & spent the rainy morning sipping a pumpkin spice chai tea latte, burning my farmstand apple doughnut candle (seriously, it smells so good), and relaxing in our cool house under my favorite blanket. I decided that I wanted it to start feeling like Fall-so even though if I were to go outside, I would still break a sweat...I'm determined to start Fall-even if it's just inside for now. 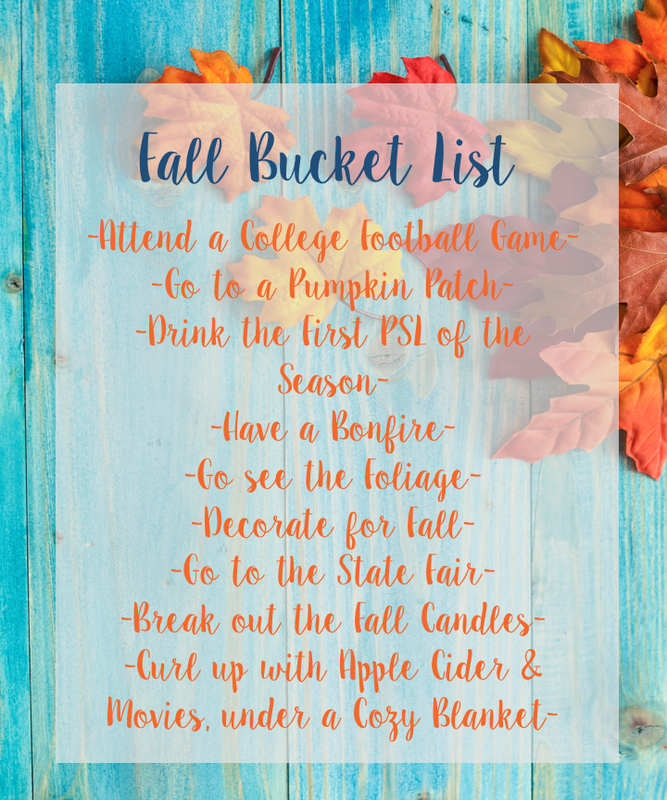 Below are my plans wishlist for Fall, let me know what you're planning to do this Fall in the comments! We already have plans for the state fair...this year I think we're going to ditch the Alabama State Fair & go to the Georgia State Fair, John Michael Montgomery is performing & that makes my 90's country-loving heart happy. I hope you enjoyed a little glimpse into what I have on my schedule for Fall & that you'll tell me what you're anticipating about the season below. Autumn Leaves is my favorite fall scent, it is so good! Looks like a great list! A bonfire would be so fun. Especially with s'mores! Great List! Apple Cider, Movies, and cozy blanket perfect fall night! I would love to know if you have any candle recommendations outside of Bath and Body Works / Yankee. I burn SO many candles and it gets expensive, but I have not found cheaper candles that I love as much. An Auburn game would be SO fun- an amazing atmosphere! oooooh I'll have to look up the georgia state fair, never been!